Bollywood actress and global icon Priyanka Chopra has gained so much popularity not only in India but also in the foreign countries after her debut in the Hollywood famous TV series Quantico. Recently, she has been quite busy in the shooting of Quantico season 3 and now she has finished her shooting in Ireland. Besides, her popularity in film industry either in Bollywood or Hollywood, PeeCee is also very popular on social media, on Instagram she is having around 20 millions of followers. However, she is very active on social media and used to share her gorgeous pictures that grabbed the eyeballs of her millions of fans. Recently, she was in the headlines for her looks in ‘Met Gala’. Her red wine dress in which she looks like a queen has grabbed the attention of everyone. Bharat actress dress was design by Ralph Lauren. However, many people trolled for her unique style of dress. But, we must say that the way she carried was tremendous. Later, Quantico star appeared in another black leather stylish dress in which the actress was looking too hot to handle. 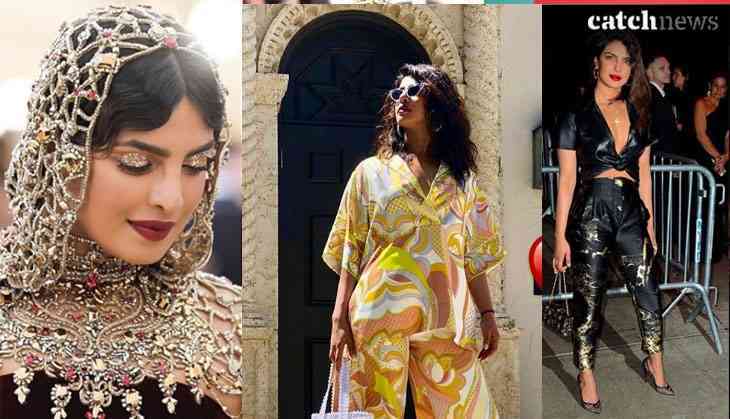 Besides, all the two her hottest looks, Priyanka also nailed with these other sensational looks on social media. Recently, she shared her pic in which she is enjoying her summers. Isn't she hot? yayy or nayy?